UAAP Season 75 Volleyball Rivalries Stop Outside The Volleyball Court. 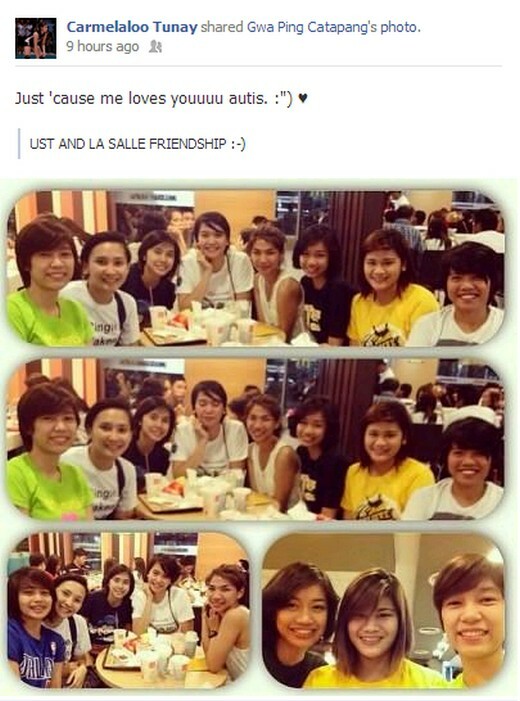 The UST Tigresses and the DLSU Lady Spikers proved that when they were spotted having some quality time together. UST’s up and coming star, Carmela Tunay was there as well as Miss Carangan. DLSU’s big time players like Mika Reyes, Abi Maraño, and Kim Fajardo were also there. Take a look at their cute photo. You can really see that they are having a great time together.